So how do you usually do it? How do you ask someone to send you the results of a query? There’s a million ways to answer that question and I’ve discovered that none of them are perfect. Depending on the situation, different ways are better than others. 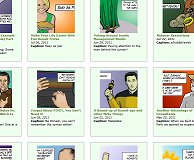 So let’s pick a situation and explore the best way to ask for those query results. Goal: I want the results of the following query. It retrieves the top 20 cached queries and plans based on total consumed cpu. I have to rely on my friend to run the query for me. I want to minimize or simplify instructions. I don’t want any truncated results. I want to assure my friend that these queries are safe. 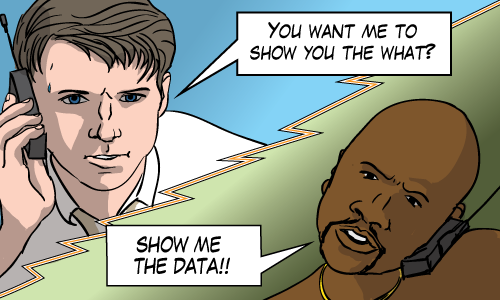 For this situation, I’m not worried how my friend gets the data to me (email, ftp, etc…). I only care that my friend is able to persist the data to some file. Notice that the results of this query contains xml, and that xml might contain commas, spaces, tabs, newlines and all the typical delimiters. That makes my job trickier. So now I’m going to list a number of methods and their pros and cons. I can think of a number of methods off the top of my head. The best part of this is that the data is backed up perfectly, the data captures all the data with no truncation. Xml fields are stored as xml fields and once restored, it’s easy to access the resultset exactly as it was on the target computer. The bad news is that although it should be fairly safe, it’s not as easy to assure my friend that the query above changes nothing. It does! It creates a whole database and backs it up. It then drops that database. Hang on a second, if my friend can use this method, that means my friend (the non-dba) is authorized to drop databases. Yikes! What’s up with that? But I don’t recommend it, not one bit. It launches a wizard which takes me through a set of choices, and no matter what I choose, it always seems to choke on the xml column. 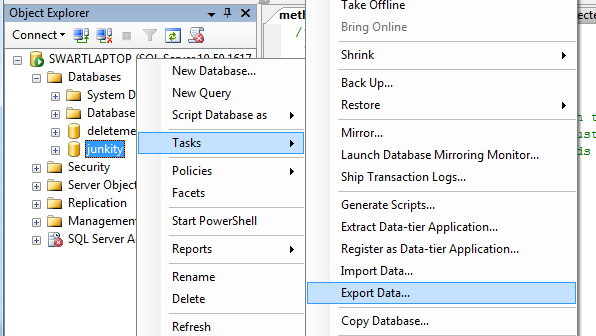 It’s clear that this Export Data Wizard is using SQL Server Integration Services (SSIS) under the covers. How do I know it’s SSIS under the covers? Well if the clumsy data type handling weren’t a giveaway (zing! ), the wizard can save the job I specified as an SSIS package. The SSIS shows through too much to recommend to my friend, who has no dreams of becoming a B.I. Maestro. So it seems like this method is only appropriate for those situations when cutting and pasting to Excel would be just as appropriate. And it’s kind of hard to write instructions simpler than “Cut and paste into Excel”. I can also enable results to file with Ctrl+Shift+F. I had to look that up though. There’s a reason I haven’t learned that shortcut by heart. It’s because results-to-file doesn’t work very well. As far as I can tell, it’s like specifying results-to-text and then pasting that into a text file. The biggest problem here is that depending on the results, the data gets truncated easily and the newlines and tabs in the data get mixed up with the rest of the formatting. 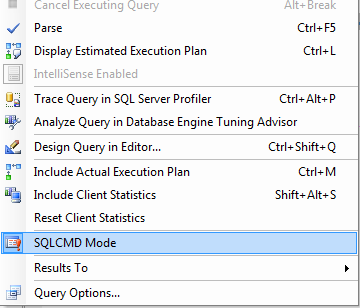 By the way, I’m also out of luck (and for the same reason) if I use SSMS to save grid results. which I could then get back on my side using bcp or using OPENROWSET. This method is okay. It’s kind of awkward (and any instructions to my friend will be equally as awkward) and it always takes some work to get the syntax just right. But BCP is kind of like Rob Lowe, he hasn’t changed in years and he’s really not that bad. And the results that are sent back are immediately accessible without any processing. 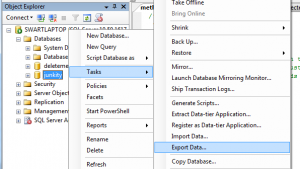 SSMS restricts XML data results to 2 megabytes, although that’s configurable. If you query binary fields (say query plan handles for example), then you might be surprised if the results come back in base64 encoding rather than hex which is a bit of a pain. Powershell I know you powershell pros are eager to give a one line script that does everything here. So lets hear it the comments! I know that powershell treats sets of objects (rather than unix’s cshell which deals with text). So I’m curious how well it serializes objects to a file. 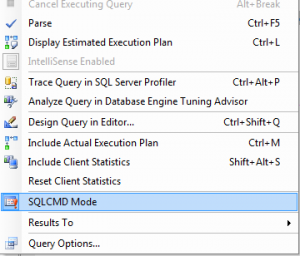 SQL Server Integration Services I haven’t forgotten about SSIS either, it’s the tool that was built for moving data from here to there in some format (any here, any there, any format). But I just couldn’t get the instructions simple enough for this scenario. I use PowerPivot for Excel, so it’s a mutation of Excel method. Attaching a file to email or in the body of the email itself it doesn’t really matter. Your link answers that question nicely. I never knew about Convert-ToHTML. That cmdlet seems really cool. Running Powershell isn’t super-easy for the novice. Do we recommend sqlps? Or do we suggest running Powershell ISE with instructions to load the SQL snapins? Your example mentions using invoke-sqlcmd2, a 3rd party cmdlet which has to be installed and that complicates the instructions further, but I don’t think we need it for this example since we’re only returning a single resultset. So invoke-sqlcmd would be fine, right? Great (and thorough) post Michael. Hi Mike, Thanks for visiting! Your video explores my “Method 4” above. It’s good to know that stuff, but it may not be ideal in this particular situation. You bump up the characters per column to 1024 from the default of 256. 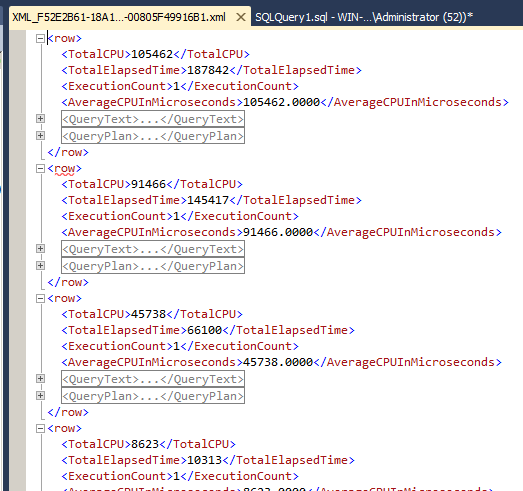 8K is the maximum for that setting and even that’s not enough for many xml query plans. 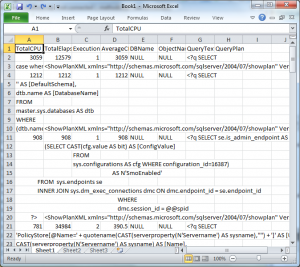 Also the new lines in the sql text still create a problem when importing into Excel. Why not create a stored procedure you can have them execute with enough parameters to meet 1 or several query needs. You control all of the code, they never know nor care what’s going on under the covers. All they need to know is when Michael calls up and says I need you to send me queryData, or perfData I run exec usp_send_michael_stuff (‘queryData’ or ‘perfdata’ or ???). Dump the results as you are now or in an email automatically and leave a nice message so they know it executed properly. You know what Chris, that approach shows a lot of promise. Especially if the engagement is less transient or more permanent. I’ll give it some thought. When I try method 6 I get the following which seems less than useful. Am I doing something wrong? If I’m right, you should see a xml link you can click on. It’s a little more useful. Good luck and let me know if that’s right. I see, the point here is to demonstrate how to get data from the person running the query to myself or some other database professional. I was able to paste this large xml document into notepad and save it. I’m not sure where you had trouble doing that. My instructions to my friend would then simply be to save the xml document and send it along. The end (as far as my friend is concerned). I can immediately see the top query here took 105 milliseconds of cpu time and was executed once since last server reboot. The query is accessible if I wanted to inspect it and so is the plan. If I wanted to look at it in Excel, I could import that data but it would take some work. The whole point is that I’m willing to do that work if it makes my friend’s life easier (see goals above). In the nonSQL world we’re considering putting in a “create diagnostic bundle”. So I guess everything would be wrapped up in a neat little package! Really, I mean that. Sorry if it sounded sarcastic. In the nonSQL world we’re considering putting in a “create diagnostic bundle” button. Very good Homer… er… I mean Dave. Great post, Michael. The query you used was also very helpful to me! Thanks. Thanks Don! Glad you liked it. Now if only I could figure out an easy way to have others collect sp_whoisactive results. If a third-party tool is an option, SSMSBoost has an awesome function that lets you script grids/selections to Excel as XML and then save as xlsx. Thanks Eric… In the exact scenario I was mentioning above, I want to minimize instructions and I’d have to convince my friend that installing 3rd party software is safe. 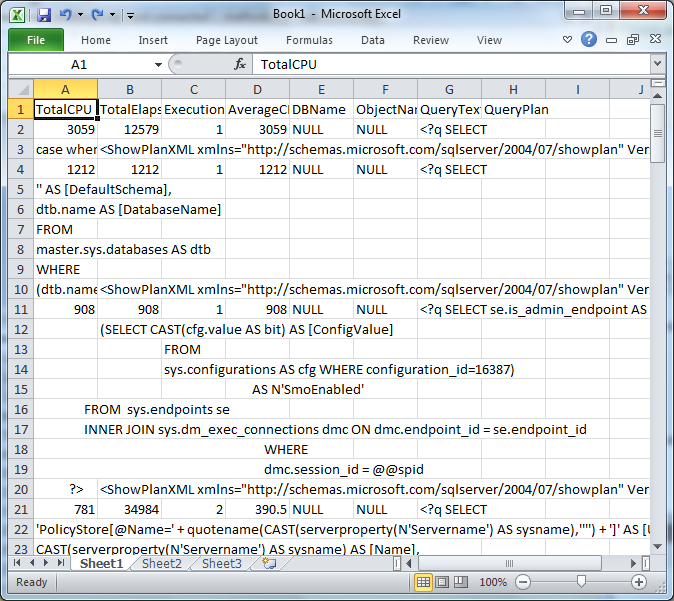 SSMS is a viable option, but I’d love to see “Copy for Excel” as an out-of-the-box SSMS feature.